UK NEQAS has produced a variety of free publications to educate laboratories and the public about our services and the work we do. All of our publications can be viewed online or downloaded for offline reading. The publications are listed in date order with the most recent additions at the top of the page. 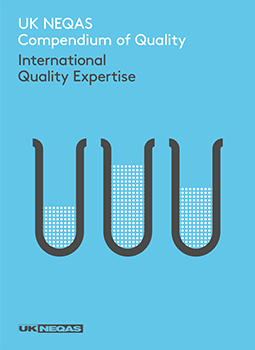 The Compendium illustrates the core activities of UK NEQAS, particularly in providing performance data for tests across the whole of pathology to diagnostic laboratories and industry, and for scrutiny of quality by UKAS, CQC, MHRA, provider governance systems and commissioners of services both within the UK and worldwide. 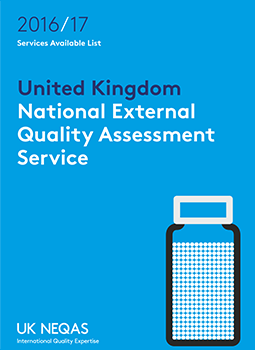 UK NEQAS provides a wide variety of EQA services which vary depending on the needs of the laboratory. The Services Available List contains full information on all of the EQA programmes currently available.